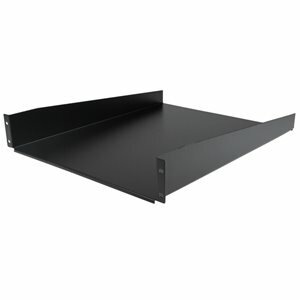 Add a sturdy, 22in depth fixed shelf into almost any server rack or cabinet. The CABSHELF22 2U 22in Depth Fixed Rack Mount Shelf lets you add a compact, 2U shelf to virtually any standard 19-inch server rack or cabinet with front mount options. This TAA compliant product adheres to the requirements of the US Federal Trade Agreements Act (TAA), allowing government GSA Schedule purchases.The high-quality rack shelves are designed to withstand harsh work environments with ease. Constructed using SPCC commercial grade cold-rolled steel, this durable fixed rack shelf can hold up to 22kg (50lbs) of equipment - a perfect solution for storing small, non-rackmount equipment, tools, peripherals or accessories in your rack to keep them readily accessible.